Secure Gateway provides websocket endpoint to connect to. Default endpoint is: wss://secure_gateway_host:9900/ws. By default Secure Gateway is exposing only secure endpoint available on port 9900. If Secure Gateway is configured to provide insecure connection, default insecure port is 9696, unless configured manually to something different. Establish websocket connection to Secure Gateway on configured hostname and port using either secured or unsecured connection. 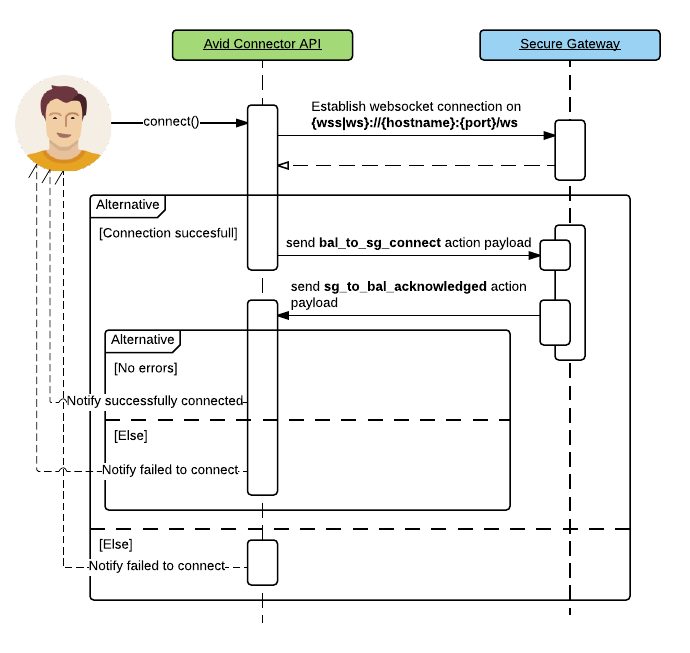 If connection is successful, then Avid Connector API sends payload with bal_to_sg_connect action to Secure Gateway. If connection is not successful, then Avid Connector API notifies caller about failure. NOTE: When websocket connection is established, Avid Connector API MUST send ping frames to Secure Gateway and handle pong frames from it.